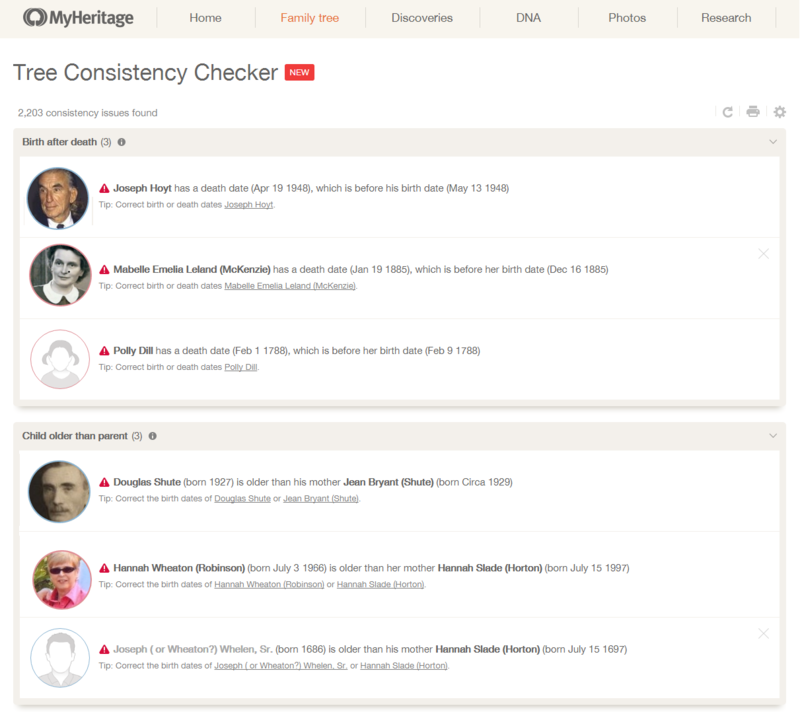 We’re excited to introduce the new Consistency Checker for online family trees at MyHeritage. This new tool scans your family tree and identifies mistakes and inconsistencies in your data so that you could make the necessary changes in your tree, improving its overall quality and accuracy. The Consistency Checker employs 36 different checks on the family tree data, ranging from the obvious (e.g., a person was born before their parent, or when the parent was too young to be a parent) to the subtle and hard to find (e.g., a person was tagged in a photo and the photo is dated before the person’s birth; or two full siblings were born 5 months apart, which is impossible). Some of the issues it finds are factual mistakes (e.g. wrong birth date entered), some are bad practices (e.g. birth year entered as 22 instead of 1922, or prefix entered as part of the first name instead of in the prefix field), some are warnings about possible data entry errors (e.g. a woman’s married surname was apparently entered as her maiden surname, or a place was entered that looks suspiciously like a date) and some are inconsistencies you may want to fix, such as references to the same place name with two different spellings. Any issue you feel is fine and should intentionally not be addressed can easily be marked to be ignored and will not be reported again. A similar Consistency Checker tool has long been available in our Family Tree Builder software and has been very much appreciated by the many users who have taken advantage of it. 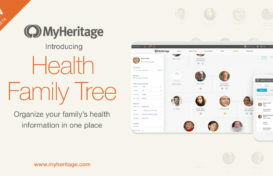 We are now providing it for the 37.1 million family trees managed by our users on the MyHeritage website. Genealogists who care about the accuracy of their information, as all genealogists should be, will be delighted with the opportunity to catch mistakes in their data and fix them. Take the challenge and run the Consistency Checker on your tree! Will your tree come out clean, with flying colors, or is it in need of serious cleanup? Most of the issues are easy to fix and we are sure that you will enjoy the process. 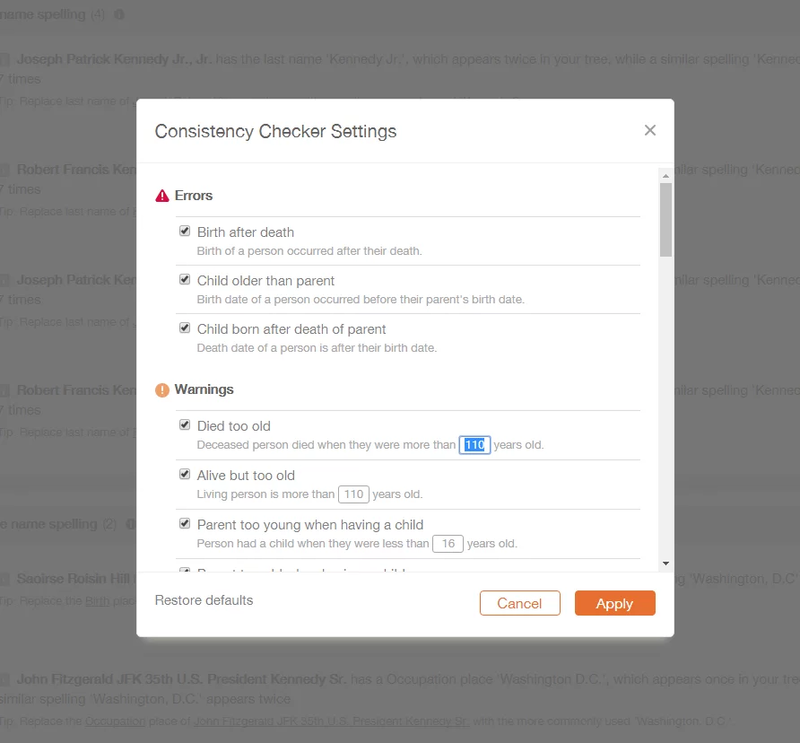 Access the new Consistency Checker via the Family tree drop-down menu in the main navigation of your family site. When you visit the Consistency Checker, it scans the family tree on your family site, displaying a progress bar as it goes along. It will tell you how much additional time is required to complete scanning. The first time around, it may take a while, depending on the size of your tree so it would be a good idea to let it run in a separate window, while you keep using the website in parallel in another browser window. Most users won’t need to wait more than 10 minutes, and the results will be worth waiting for. The results are stored for quick retrieval, so subsequent visits to the page will be much faster and will load the previous report unless you decide to re-run the checks. Once you get the list of issues, go through all the inconsistencies found one by one, and fix them so that your data will become clean and error-free. Then run the Consistency Checker again and rejoice if no additional issues are found. Repeat this from time to time after making many edits and additions in the tree; and of course, don’t forget to do this if you have received a family tree from another relative and imported it to your family site as a GEDCOM file. The Consistency Checker displays a list of all the issues it found, organized by category. At the top of the list, you’ll see how many issues have been found in total, and the number of issues found in each category is also displayed. Issues are grouped into three different categories. First Errors are shown, then Warnings, and lastly Notices. In the example above, you can see that a large age difference between spouses is unusual, but not necessarily incorrect. So, you can examine each of these cases and determine if they are erroneous or not (an age difference of 100 years between spouses is certainly incorrect, but a difference of 38 years can certainly happen, though if the wife is 38 years older than the husband, then historically it is more likely to indicate some error). The threshold of warnings like these is configurable, and you can change it through the Settings, as explained further below. For example, if there are many cases in your tree where the age gap between husband and wife was 49 years or less, you can set the threshold to 50 years and only be alerted about cases you are certain are errors. Notices indicate a potential problem but the likelihood of a mistake is smaller. They are shown with a gray square icon. The following is a group of notices for siblings in the same family who have the same first name. This is only a Notice, since, depending on the culture, it can be very common for siblings to have the same given name. Or one sibling may have been given the same first name after the other had died at a young age. However, there is still a risk that you have entered the same person twice into the family tree, and it’s useful to have this Notice flag this for you to verify. • Personal photo (portrait) of the person involved. If the issue concerns 2 siblings or 2 spouses, then 2 portraits are displayed. Move the mouse over a portrait to see the person’s name, relationship to you, and years of birth and death. • Description of the issue: in the description, names of people are links that go to the relevant editing page that allow fixing the issue. • Tip: a recommendation about how to correct the issue, with useful links that are underlined. • Comment: Sometimes there is a comment with additional information. • Photo: When a photo is involved. Every name in the list (as in the example marked below in red) is also a link that opens a page for editing that individual in a separate browser window, allowing you to fix data quickly. You can also use the convenient links in the Tip to go straight to the right place to fix the data. Some issues listed can be fixed directly from the Consistency Checker, with the click of a green quick-fix button. For example, if you received a warning that your great-grandmother is not marked as deceased in the family and is rather old (149 years old), you are given the option to quickly correct it. Move the mouse over the issue, and a green quick-fix button will appear offering you to mark her as deceased in a single click. Below is another example of an issue that you can fix directly using quick-fix without leaving the list. Here, the prefix Dr. was entered incorrectly as part of Dr. George Warren Eastman’s first name. Clicking the green button below the issue will automatically move Dr. from the first name field to the prefix field, correcting the problem. A similar fix is offered in case you’ve incorrectly entered a suffix (such as Jr. or III) inside the first name or last name, instead of using the suffix field. For many issues, there may be more than one way to correct an issue, and your judgement or input is required. This is often the case for issues affecting more than one person in the tree. For example, an error may indicate that a child’s birth date is incorrect, or that the parent’s birth date is incorrect, or both. These issues cannot be corrected with a simple click of a button. In such cases, click on the names of the people involved, that are conveniently provided in the description of the issue, and you’ll be taken to their family tree profiles where you can manually correct the issue. In every case, the most appropriate page for editing will open allowing you to fix the issue in the shortest number of steps. The Consistency Checker runs on one family tree at a time. If you have more than one tree in your family site, use the family tree selector at the top of the page to select which family tree to scan, as shown below. For any individual in your tree for whom consistency issues were found, you can conveniently access those issues from the profile page as shown above. If an issue isn’t clear to you, click on the information icon next to its title, as shown below, for a more detailed description of the issue. You can ignore a specific issue if you think there is no error in your data, by moving the mouse over the issue. A small ‘X’ will appear in the top right corner. Click the ‘X’ to ignore the issue. Ignored issues will not be reported again. If an entire category of issues is not useful for you, you can disable that check entirely. Do so by clicking the ‘X’ on the same row as the title of the issue, as shown below. You can re-enable it later from the Settings. At the top right corner of the page, you will see three additional options. The leftmost button is Recalculate. Click this to run the Consistency Checker again. This is useful after you’ve made fixes in your data, to force the checker to run again and prepare a new list of issues. The Consistency Checker will also give you the option to run it again at the top of the page if it notices that you’ve made changes in the tree after the last time you scanned it in the Consistency Checker. Click the Printer icon to print out your entire list of issues. Click the Settings icon to edit the Consistency Checker Settings. Here you can disable any checks you wish to exclude from the report, or re-enable them. You can also configure the threshold for some of the warnings. For example, you can set the age above which you will be alerted that someone in your tree is probably no longer alive and needs to be marked as deceased, instead of the current default which is 110. Click “Restore defaults” if you want to reset everything to the default settings. The settings are stored separately for each family site that you manage. The Consistency Checker for online family trees is a paid feature, available without limit to users with a PremiumPlus or Complete subscription. If you do not have a PremiumPlus or Complete subscription, you will still get one issue for free from each one of the 36 checks and get a lot of value from this feature for free, and the rest will be displayed once you have a subscription. The next phase of the Consistency Checker we plan to add is to apply many of the checks in real-time as the information is added or edited in your family tree. Once we implement this, whenever you’ll enter something potentially incorrect or inconsistent into your tree, that the Consistency Checker recognizes, it will catch that automatically and give you a warning message so that you could fix the issue immediately if you wish. There are several additional improvements we plan to add to the Consistency Checker in the future, such as the ability to search the list of issues by a person’s name, and the dispatch of a periodical notification email with a summary of pending consistency issues in the family tree. Ask many genealogists, and you will often hear that other than their own family tree, which is close to perfection, family trees of other users, especially those posted online, are full of mistakes… Whether or not this is true, we should not put up with mistakes as an inevitable part of life. We must strive to correct them whenever we can, and create the most accurate genealogy data possible. Many mistakes can be avoided by careful attention to detail and by following best genealogical practices — not taking anything for granted and verifying every assumption and piece of information encountered during research, and citing its source so that others may inspect it in the future. At MyHeritage, we hold accuracy in high regard. Admittedly overdue, we are now doing our part to improve family tree accuracy by providing our users with the Consistency Checker for online family trees. We have invested significant thought in the creation of this tool, improving it to detect many common mistakes that we have encountered in family trees. A Consistency Checker like this is surprisingly missing in many other online family tree services similar to ours. While it will not catch every possible mistake that you may have in your data, and it may not detect it if you have added the wrong relative into your family tree, there are many types of errors and problems that it will catch and bring to your attention, so that you could fix them. With this tool, you can improve the accuracy of your family tree and of your entire research, making your family tree also a better source of information for others. We encourage all our users to use the Consistency Checker and use it often. The Consistency Checker is an important tool for family historians of any skill level. It is another step forward in our goal to innovate and make available exciting technologies for better family history research. 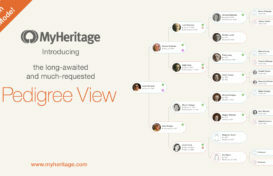 We hope it will improve the quality of collaborative genealogy. We welcome your feedback and will be happy to enhance the Consistency Checker further based on your suggestions. What is the url of the consistency checker (e.g. like https://myheritage.com/consistency-checker.php …) ? 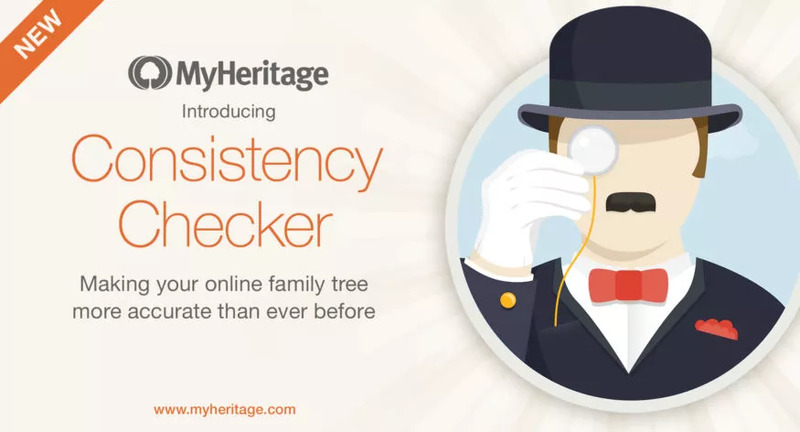 You can access the Consistency Checker for each family site under Family Tree > Tree Checker. Great news! Now if we only had a tool to check for duplicate people! Or maybe you do but I haven’t found it yet. One of the notices offered with the Consistency Checker is for multiple siblings with same first name. This can be a good indication for duplicates found in your family tree. Is this being rolled out now or at a later date? I don’t show it on my family tree page. The drop down menu ends at Charts. We’ve been rolling it out gradually, but all users should see this feature on their family sites within the next few days. EXCELLENT!!! This is a much needed tool. Thank you so much. It looks like a very much needed and appreciated program. Thanks for this new functionality. 1. I have 553 errors in a tree of 2015 people. But many of those errors are for a branch of the tree that I have no current interest in. There should be some way to tell the consistency checker (and ALSO other MyH functionality) that I don’t want to include anyone in X tree branch. The easiest way I see to do this would be to allow me to see my tree and right-click to temporarily/permanently exclude everyone below a person. 2. When I choose an error to deal with, I click on the person, which opens a new tab/window with the person in the Essentials segment. This is a problem because there is no way to do research from this segment, such as seeing the tree portion this person is in or invoking the actual research function. Currently, the checker shows all issues in your tree. We understand that if your tree is very large, it may be overwhelming to see a lot of issues about people that you may not be researching at the moment. You can use the ignore icon (a small X that appears on the top right of an issue when you hover over it). Clicking the ignore icon would remove this specific issue. It may be helpful to add the option to concentrate on a specific branch of your tree. Thank you for the suggestion, we’ll take it into consideration. Clicking the name of the person, or the link in the tip brings you to the edit page. Most of the times it’s to the essentials tab, if the issue has to do with the person’s name, birth or death (which are editable in this tab), but sometimes to another tab if that particular piece of information is editable in another tab (e.g., marriage date, or some other fact). If you click the photo of the person (or the silhouette if the person doesn’t have a photo), it will bring you to that person’s profile page and from there you can click the “View in tree” link to go to the tree. Wonderful! Now, how do I access the paternal Surname of grandfather, Joseph F. Seaman born in Hungary? Which if these new facilities is available in the mibile phone app? The Online Family Tree Consistency Checker is not yet available in the mobile app, but may be in the future. I think this is an excellent improvement to My Heritage. One additional device that is needed is an easy way to delete duplicate entries in the tree. If these duplicates become deeply embedded, it is almost impossible to remove them without losing a lot of data. Good luck with that effort. I really like this new feature – found lots of people that had no death date so made some over 200 years old (that only happens in my fantasy and SciFi books). So since I couldn’t find death records I made up the a year and marked it as unsure. A lot of my consistency issues were just typos but I haven’t figured out how to fix the ones where some one was born before their mothers or born after their mothers death – all these came from Smart Matches of Instant Discoveries. I would like to see this checker also look for duplicate people (same name, dates, etc). I have one person that is in my tree but is under two different parents. Again this came from Smart Matches or an Instant Discovery. Some of these duplicate people come from Family Search matches – so I have learned to be very careful confirming those. In general, this is a great feature and I have already fixed lots and lots of errors. I’m so excited about this feature as it is such a challenge to repair online trees. Thank you so much. Unfortunately, in Firefox and Chrome (updated all), it locks up at this point: 123 consistency issues found (700 of 2,368 people) – Estimated time left: 3:28m 28% complete. Hours later remains the same. I’ve refreshed the browsers and cleared the cache and it continues to lock at this point. I suggest starting and leaving it running overnight. Your tree may have a long list of issues that is being calculated. Thanks, Esther. I left the web page open for two days. It hasn’t left the 28% mark. I’ll try it on a different computer. Thank you. somehow. I will attempt to correct as much as possible as time permits – my computer is not online, so use an iPhone. Date of Probate Date of Eliza Tate (June 3 1942) occurred after her death date (June 10 1941). It’s rather difficult to get Probate before death!